“When the subject of critics arose, Tennant just laughed. ‘I love to give them a hard time,’ he said in an interview here. ‘In America, I proudly go around and say to these critics that we’re a disco group. I know they hate disco. We kind of rub their faces in it. God, he was a putz. 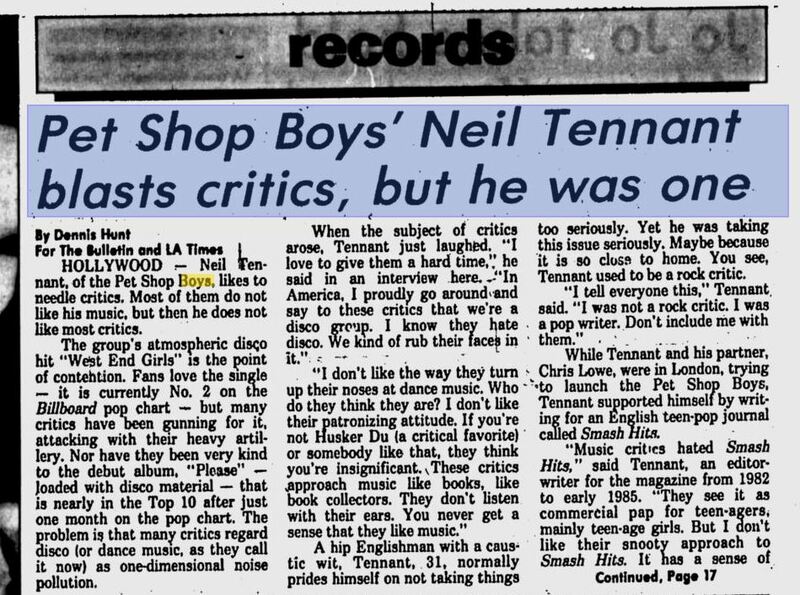 If you’re not a fan, Steve, I get it, It’s not exactly Tennant at his wittiest or sharpest — though his essential argument was, at the time, refreshing — but he may well be my favourite pop person ever, not that I’ve ever thought of ranking pop people in such a way. Actually, he was mostly right. Thanks, Jack (er, Mr. Thompson*). Yeah, I think he’s absolutely right, at least insofar as he was describing a tendency — an overriding tendency, for sure — in rock criticism. * Depends how one defines “nasty,” I suppose, but I’ve had my moments. I’m somewhat surprised—maybe I shouldn’t be—that Tenant was even cognizant of Husker Du at the time. (The writer apparently felt that some parenthetical explanation was required.) He could just as easily have named the Talking Heads or the Del-Lords or one of those other big 1986 American bands.